Like an 80’s child chomping on countless pieces of Fruit-Stripe flavored gum during a great daydream, Ready Player One is a film studies class by way of pure pastiche, shooting its way through the ridiculous obstacles of a mini golf course at the time-warping speed of a DeLorean, and it is perhaps the strangest and most mesmerizing masterpiece this side of Y2K. Nowadays we have every resource at our immediate disposal, our youth measure time in anticipation rather than waned want, and self-gratification has become a dressy trend instead of a backburner desire. I’ve seen 100’s of films that feel like Steven Spielberg’s latest roller-coaster cautionary tale, but I’ve never viscerally experienced another motion picture quite like this futuristic dip into the bittersweet shell of nostalgia. Ready Player One is Spielberg’s own introspection via virtual reality, carefully examining the influences of his past through the sage lens of a natural technological progression. It’s a big, bold, beautifully disorienting game of trivia, and it’s absolutely one of the finest films I’ve seen in 2018. Adapted from Ernest Cline’s well-known novel – a pop-culture symposium in and of itself which I regrettably haven’t read – Ready Player One depicts a not-so-far-off future that for once might become reality far sooner than the fiction previously predicted. Columbus, Ohio looks worse for the wear in 2045 despite the fact that it’s the fastest growing city in the world. There, in “The Stacks” of mobile homes lives Wade (Tye Sheridan), an orphan subjected to the negligence of his Aunt and her string of bad boyfriends. Not long ago, when things didn’t go your way, you’d have to close your eyes and imagine a world where all was right. But in this future you gear up and strap into what’s called “The Oasis” with clear, open eyes. It’s a VR landscape where imagination is unlimited, utterly rampant, and where people go to reveal the deepest truths of their selves whilst hiding behind their carefully constructed avatars. The way that these characters present themselves through virtual reality compared to how they carry themselves in person – and how all of us do the same – is as much a sign of their self-determined strengths as it is an obvious indicator to outsiders of their harshest insecurities. We’re all critics, really. The mastermind behind this Russian Nesting Doll is Halliday (Mark Rylance), a cross between the visionary nature of Steve Jobs and the wiry haired, awkward cadence of Garth from Wayne’s World. Halliday is a next-gen version of Willy Wonka. A recluse whose creations mimic an alternative reality where possibility – especially for vindication and the opportunity to flip regret on its wit’s end – is not only thinkable, but able to be constructed and chased with the guidance of a well-searched inner conscience. While Wonka gave a proper chocolatiers’ tour with tests varying in their increasing levels of enticing sweetness, Halliday posthumously laid an Easter egg in the depths of The Oasis. You have to finish three tasks to earn three keys, and even then, the answer might not be the Golden Ticket you assume. 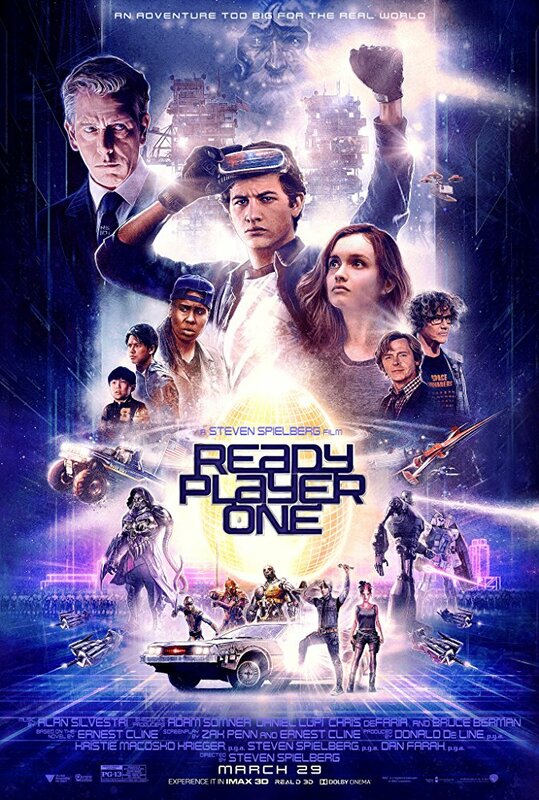 Ready Player One, similar to the befuddling and great original adaptation of Willy Wonka, structures itself like an appealing Indiana Jones adventure while also embedding the playful, economic confrontation of a Golden-Aged Frank Capra classic (I couldn’t help but smile at the borrowed use of the line “no man is a failure who has friends”). This is more than a movie; it’s an event, a whirlwind glimpse into the mind of a curator who’s as desperate to preserve the influences of his past as he is to encourage those who will surely follow in his footsteps. What a gift. As Wade/Parzival (his AI alias) journeys through the Oasis, spending time with the best friend he’s never met named Aech/Helen (Lena Waithe) and falling in love with the rebellious Artemis/Samantha (Olivia Cooke, proving once again that she’s as talented as they come), it becomes quite clear that the entire story is one big allegory toting around an old duffle bag full of relevant metaphors. They play, meet, run, dream. It is called the Oasis after all. Perhaps this is the future’s version of playground days, just more interpretive than it is real. As they’re chased by the antagonist Sorrento (Ben Mendelsohn), a small-minded business man (he sports an avatar that’s a bustier, Mr. Universe sized ego embodying his actual likeness) trying to mine wealth through industrious efforts instead of savvy, it becomes apparent that Spielberg is speaking to us through story. Some of the social commentary becomes lost to all of the noise, but we hear what’s most important – that the value of art and media only resonates when we can compare it to real world experiences, and that we can all be heroes if we so choose. Ready Player One scores even when it misses, creating fully realized side characters who function instead of floundering, and it hypnotizes those of us in the audience into believing that every single thing on the screen – from the shockingly well rendered avatars to the real-life portraits of humanity – aren’t just believable, but so conceivable as well. The point of this Easter egg endeavor isn’t to hunt down every pop culture reference and throw it into your basket, but to collaborate and compare with all of the people around you doing the same sort of searching. “Hey! Look what I found! Isn’t it awesome? !” Ready Player One is the kind of film we can all enjoy because it allows us to feel rich and to reap rewards in our own ways, and while it certainly is flawed, I can’t recall the last time I watched a film this big that managed to feel so intimate and small. It made me cry out of a sheer collective sense of awe and joy.